Researching the way emotion is experienced in response to external international threats, I’m becoming more aware of the judgement calls we make towards what is to be ‘feared’ and what is not an immediate cause for anxiety. When and why does personal reaction collide with what others consider irrational and unnecessary fear? I might be paranoid if I stayed indoors for fear of being mugged – but who decides the line between paranoia and pragmatism? Watching the Akira Kurosawa film ‘I live in Fear’, translated directly from Japanese as ‘Record of a Living Being’, this question of one individual’s fear becoming disassociated from the realistic context of his existence is rendered stark. 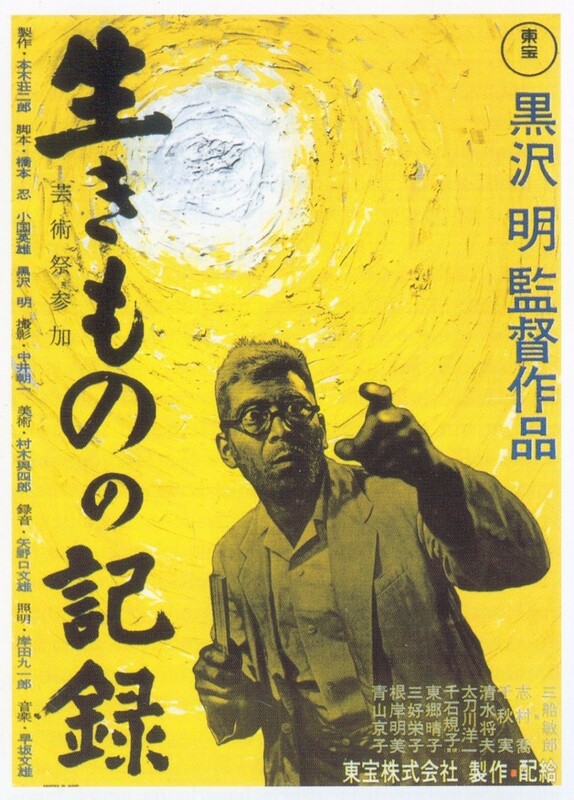 Made in 1955 it depicts an elderly man, Nakajima, who’s inhibiting fear of the hydrogen bomb drives him to plan the emigration of his entire family to Brazil. South America he thinks, is the only safe place left on earth. His family take him to court in order to avoid the financial disinheritance he has threatened them with if they do not capitulate. The film follows an acrimonious and fraught family saga in which the logic of the legal system is used to argue a case against one man’s irrationalities. Nakajima’s fear of the nuclear threat is presented at once as comical, beyond the realms of everyday life and insane: others laugh at, ignore, or argue against him. In one scene a prison cellmate asks: ‘H-bombs eh? What a fool you are to worry about it; let the Prime Minister do that. If you’re worried why don’t you move out of earth?’ In a public family shouting match, his son proclaims ‘don’t you realize that no place on earth is safe? Four hundred H-bombs will destroy it. There are more than that now.’ His fear is irrational because not only is it beyond his personal control: governed by politicians, the military and scientists, but it is also too late for fear – once the bomb is detonated there is no escape, it is pointless to worry. Nakajima’s mind is described as having ‘no limitation’, ‘he’s born to take everything too far’. It seems that what Kurosawa really wants to ask is: why is this man’s fear unjustified? Why is it acceptable to live at the behest of the authorities, the ‘experts’ when if considered pragmatically the creation of 400 H-bombs that might destroy the world appears absurd, irresponsible, flippant? In 1950s Japan, world war two and the cold war created a critical attitude to military policy that was only softened as popular attitudes absorbed the conventional pragmatic approach to the global context. Paranoia transforms into insanity, and by the end of the film Nakajima is restrained in a mental asylum. His bizarre story is the record of how a living being, governed by its own emotional and private response to the world, can become an isolated social aberration. It poses the question: how far are our own emotions propelled by the structures and expectations surrounding us?